If your home kitchen is like ours, it’s put together with a blend of cultural influence, space limitations and budget constraints. The cultural influence part is easy - we cook how we were taught as children, blending our different cultural influences to create menus we love, which put good, nutritional meals as well as nostalgia on the table. A food processor. From baked goods to chopping peppers for salsa, a food processor with several different blade attachments is invaluable. Shredding the cheeses to make the lasagne; chopping the peppers and onions - even blending spices or making pasta dough - I couldn’t live without it. If not every day, this appliance gets used several times per week. A slow cooker. Anyone who loves to walk in the door and have dinner ready will appreciate a slow cooker’s usefulness. From sausage and peppers to soups and stews - or even a roast - and more complicated dishes like chicken cacciatore - in our home, a slow cooker takes pride of place on a shelf where it can easily be seen and accessed. We have the type with a removable ceramic insert, which makes cleanup a breeze. A good, six-bladed blender. While technically I can use my food processor for many things for which I use my blender, the blender holds more liquid than the food processor does. Processing soup; making after-school smoothies or quick breakfast drinks; chopping ice; making hummus, a fresh salsa or pesto - every family member has a good understanding of how to use our blender. An electric griddle. What? Isn’t this a novelty item, and where will I store it? I found a place - it goes at the bottom of the pot cupboard, protected by a towel, and the pots sit on top of it. There is still room for storage, and I am glad we have it. We use it for pancakes; sausage and peppers; grilled and stuffed eggplant - and our favourite: Indoor burger or chicken preparation with bacon, the burgers or chicken and onions and peppers, all at the same time. Get the largest one you can afford and store - you won’t regret it. The strongest-powered microwave you can afford. Here’s why I picked a microwave for our fifth “must-have” appliance: We have children. Even the youngest can successfully heat soup; make popcorn; warm my coffee for me; re-heat leftovers; use a ceramic pot to ‘cook’ bacon or a hamburger; warm garlic before skinning it; use the plastic steamer to steam vegetables and - we discovered this one by accident - warm up chocolate chip cookies, to which we add a scoop of vanilla ice cream for a sweet family dessert. We will likely all have our favourite appliances. But the ones I have listed here are great for families. If you are frugal enough to seek a small appliance out second hand or at a garage sale, by all means, do so. Don’t be too shy to ask to plug it in to see if it works. Lots of people receive appliances as gifts, but have no use for them. They then donate or sell them at a garage sale. It’s where we got our first food processor! 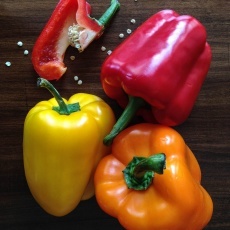 Into the bowl of a food processor or the jug of a blender, put a seeded sweet pepper, cut apart in chunks. Add a small cooking onion, also in chunks. Add a small bunch of cilantro and a couple of teaspoons of lime juice. For heat, use your choice of hot pepper, pepper flakes and/or hot sauce. Process until chopped and blended, then transfer to a serving dish and add two Roma tomatoes, seeded and chopped. Add a half-cup of frozen corn niblets, thawed, if desired. Makes enough for a family of four to enjoy with corn chips, or as a condiment for burgers. Any leftovers keep very well in the freezer, and can later be added to soup, chili or pasta sauce.